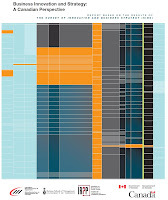 Industry Canada has launched recently a new report on Canada's enterprises and their innovation and business strategy. Between January and April 2010, a sample of 6233 enterprises in Canada with more than 20 employees and spanning 67 industries were surveyed. Various experts from the Center for Interuniversity Research and Analysis on Organizations, the Massachusetts Institute of Technology, the Rotman School of Management at the University of Toronto, Stanford University and the University of Wisconsin–Madison provided valuable advice during the development of this pilot project. The objective of the survey was to improve the understanding of market and policy factors that encourage or discourage the adoption of entrepreneurial and innovation-oriented business strategies. Manufacturing enterprises report that they primarily respond to new competition by changing prices. High-tech manufacturing enterprises are also likely to respond by adopting new technologies or by introducing new innovations. Two out of three enterprises in Canada, and four out of fi ve manufacturing enterprises, report having innovated in 2007–09. Co-innovation (e.g. product innovation that requires the introduction of a new process) is common in Canadian enterprises, illustrating the complex nature of the innovation process. For downloading the report in English, please click here. Pour télécharger le rapport en français, veuilez cliquer ici.